Density Control:The Blob has the mutant power to create a mono-directional gravity field beneath him that renders him completely immovable as long as he is in contact in the ground. With intense concentration, he can extend the gravity field over ten feet, such as when he extended his gravity field in his jail cell, causing it to implode. He can manipulate his mass to the point where he can increase the density of his obese body, making him impervious to most physical attacks. Bullets, missiles, knives or lasers can't hurt him; they just get stuck in his fat, which he can re-direct back. Recently his powers were increased by Onslaught allowing him to extend parts of his body outwards, smother people in his fat, and use his fat to catch oncoming projectiles and re-direct them. 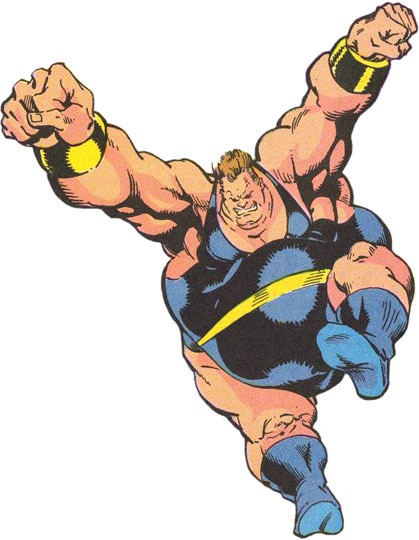 Growing up and believing himself a freak, Dukes was a part of a travelling carnival (where he earned the nickname, the Blob,) and was then contacted by the original X-men to join them in their school for mutants. Instead, he refused, and then fought the X-men.